With a constructive critique approach, we would say the Utz logo is charming and historic. The colors are bold and bright, but oddly, they are not flavor colored, they just have random colors. Utz must be very confident of their position in the marketplace because all of their own brand bag designs are very dated and border on inappropriate for a modern market. In this instance, the only differentiation between these and the regular variety of the same flavor is the uninspiring 1970s dark green lettering that says 'ripple cut'. 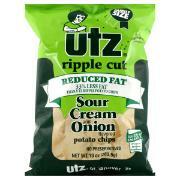 The lower fat content made no difference between these and the standard Utz Sour Cream & Onion Ripple Chip. While they lacked the hard, firm crunch of a Kettle Chip, the Ridges aided a good early crunch that turned to melt in the mouth Chips quite quickly. The contents of our test bag differed minimally to the higher fat relations in the Utz range. The Ridges provide more character than the regular Chips. They were however similar in color. They had some browning here and there, and a fairly thick coating of white powdery seasoning. There were also similarly, a few green flecks on the Chips. Although these Chips had around a third less fat, and the saturated fat content reduced a little on conjunction with this, they start off much higher than some other company Chips of this flavor anyway. In addition to this, the sodium and sugar content increases over Utz other Sour Cream & Onion varieties. The good news is the taste between these and the others in the range is much the same. It featured a mild and creamy potato, backed up with similarly mild onion.